To be notified when this product is available, please click here. Discontinued Note: This item is currently discontinued and is not expected back. You may sign your email up below for an In Stock Notification in case we find more inventory available in the future. You show a link of golden chain rings in your hands. You drop the top ring, and it falls all the way down to the bottom! You can hand the chain to the spectator, and eventually, they may be able to do the same if they are lucky! 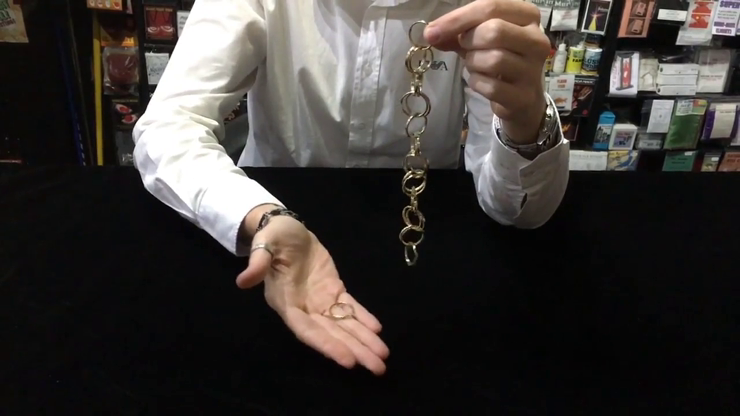 You take the chain back, and repeat the effect, but this time the ring falls completely off and you place this in your pocket. You keep repeating this several times, then hand the chain back to the spectator. He will be unable to get the ring to fall off at all! A great piece of walk-around magic and puzzlement ideal for any audience. Comes complete with chain and full instructions. Let us notify you when this product is available to ship! Simply enter your details below and we will send you an e-mail when “Misers Rings by Merlins of Wakefield - Trick” is available to ship!